Hindustan Aeronautics Limited (HAL) has given a major blow to the ambitions of Rahul Gandhi. 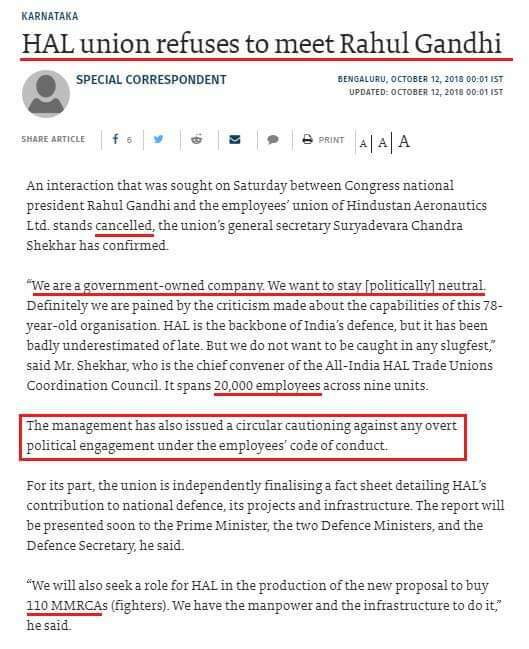 HAL thwarted the Congress president’s attempt to interact with their employees, thus refusing to let Rahul Gandhi give a political touch to the grievances of the concerned body which was as alleged by the Congress president himself sidelined by Dassault aviation from the Rafale deal. It all started with an innocuous clarification by the current Defence Minister, Nirmala Sitharaman, who asserted that the Rafale deal was clean, as it was Dassault Aviation who had chosen Reliance Industries as their partner. Nirmala Sitharaman also clarified the reason why HAL was not chosen by Dassault, owing to their poor track record in the recent past, and yet, Rahul Gandhi continued with his fantastic theories, in a futile attempt to shame the incumbent government. Had Rahul Gandhi not been a practicing politician and that too of the biggest opposition party in the country, his skills in tale spinning and comedy would’ve been a rage throughout the world. But right now, his antics are more embarrassing for the nation, especially in the recent Rafale deal, where his hallucinations have made the deal a laughing stock for the entire world. From changing the prices of aircrafts more than once, to his tall claims about NDA blackmailing Dassault into entering an agreement with Reliance for Rafale aircraft, Rahul Gandhi has concocted whatever one can think of. One must also salute the HAL and its employees for maintaining its cool and not allowing the opportunistic politicians like Rahul Gandhi to hijack their movement for selfish motives. In today’s times, when the allegedly aggrieved are slowly brainwashed by opportunistic politicians like Rahul Gandhi and Arvind Kejriwal into peddling their political agenda, HAL has chosen to stand out as an exception. As far as it goes, it seems that Rahul’s desperate attempts to corner the Modi government has failed miserably, and he has been soundly rejected by the public as well. The present rejection of HAL also reflects that there are no takers for either the Congress President’s concocted fiction on the Rafale deal or his desperate attempts to spread chaos in various parts of India, for e.g. the recent hooliganism on North Indians in Gujarat. With HAL rejecting Rahul Gandhi on his face, it is now clear that the Congress President is devoid of any credibility in the country. Since he is unlikely to stop posting his allegations on the Rafale deal or any other matter which he has no knowledge of, it is only a matter of time before the voters of the country will silence him for good with their polls in the upcoming elections. The game is almost over for Rahul Gandhi and the Congress, it remains to be seen how long can Rahul Gandhi go without accepting this.